Inn of the Governors delights in hosting a daily Tea & Sherry hour from 4-5pm for guests of the Inn. Choose from a variety of tea flavors and fresh cucumber water to help unwind from a full day of shopping, museum hopping, and art viewing, or relax into a savory demitasse of one of our Sherries. It might be that you have not enjoyed Sherry before, had it once at an academic celebration, have vague memories of your Grandma drinking it, or maybe you only associate it as a cooking vinegar. Sherry has never held the American palate’s attention as much as Wine, Beer, or Liquor. The closest Sherry ever came to the limelight was when NBC’s Frasier regularly plugged it as the beverage of the intellectual and urbane, which honestly didn’t go very far to broaden its appeal. To help with this, we serve two of Sherry’s most common expressions so you may sample them and conclude for yourself if Sherry has a home in your liquor cabinet. By way of celebrating over 50 years of service, we have a third beverage unique to the Inn called The Golden Spirit. To create it, we teamed with a local distillery, Santa Fe Spirits, to create a unique blend of cream sherry finished with local distilled apple brandy made with apples grown in New Mexico. Inn of the Governors takes pride in serving one of Spain’s most iconic sherries during our daily complimentary Tea & Sherry hour; Osborne is best known for the black bull that dots the Spanish countryside – so much so that the bull has almost become synonymous with Spain as much as Osborne itself. 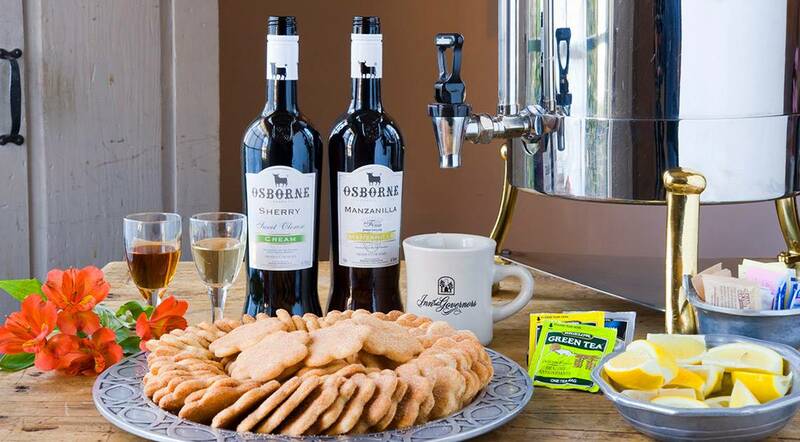 Osborne has a 200 year tradition of making fine wines. They also produce elegant liqueurs and specialize in Iberian ham. 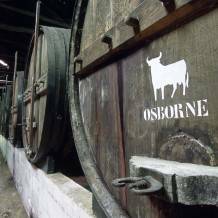 For more information about Osborne sherry as well as the company, you may visit www.osborne.es. Dry Sherry is a light, crisp sherry which tastes similar to a Chardonnay or a Johannesburg Riesling. It is traditionally an aperitif to freshen the tongue before dinner. It is also referred to as Fine Sherry, or Fino. Cream Sherry is a full bodied sherry which tastes similar to a fine Port or a Cognac. It is traditionally a dessert beverage. The Golden Spirit is a full body, yet playful blend of cream sherry finished with locally distilled apple brandy from Santa Fe Spirits. 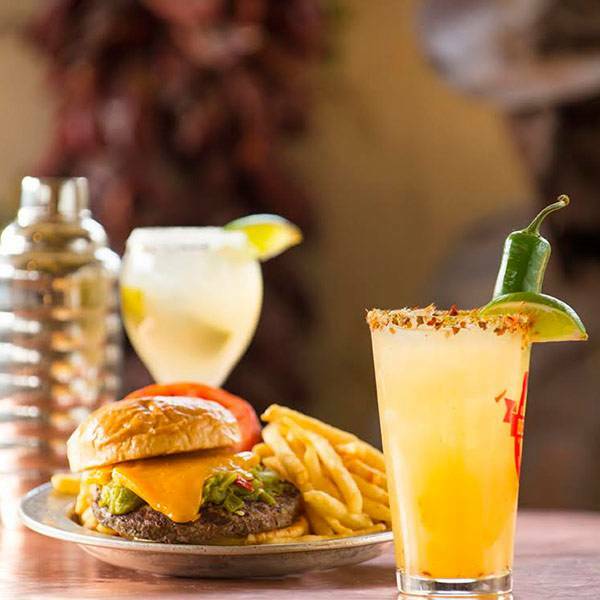 For more information about Santa Fe Spirits’ apple brandy and their other award winning spirts, please visit www.santafespirits.com. They also have a tasting room just blocks away from the Inn. A note about Sherry and Port: Port is produced in the Douro Valley in Northern Portugal; Sherry is produced in the province of Andalucia in Southern Spain. Port is mostly made with red grapes; Sherry with white grapes. During the production of Sherry, the wine is allowed to fully ferment before the addition of brandy, resulting in a dry fortified wine. In other words, all the sugar in the grape juice has been consumed by the yeast and then it is strengthened with the spirit. When making Port, the distilled spirit is added during fermentation which stops the process and results in residual sugar in the fortified wine. Therefore, the dry Sherry will generally make for a better aperitif, while the sweeter Port will make for a better digestif. Sherry and Ports are both known as fortified wines. Fortified wines have been strengthened with a distilled spirit, usually a grape brandy. Speaking of dessert, you may also enjoy a Biscochito, the state cookie of New Mexico. New Mexico state legislature enacted the Biscochito as the state cookie in 1989, though the recipe dates back to the 1850’s; it was designed to be a portable cookie-perfect for a few day’s ride via horseback or covered wagon. 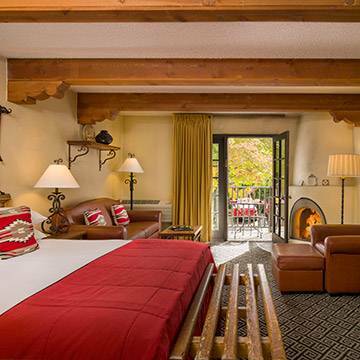 It was originally cooked in a Horno (pronounced or-no)-an outside oven made of mud adobe. The Biscochito has since become a Christmas tradition in New Mexico to serve to relatives and friends alike. We look forward to seeing you at our Sherry Hour!